Hi there. 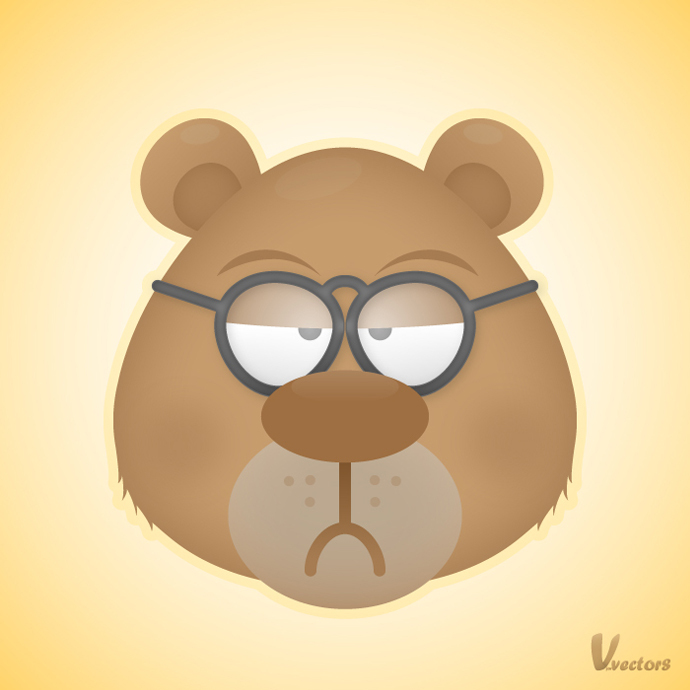 In the next tutorial you can learn to create a grumpy bear face. For the basic shapes you’ll only need the Ellipse Tool and some Warp effects. Later, for some discrete details, you’ll need the Inner Glow, the Gaussian Blur or the Drop Shadow. 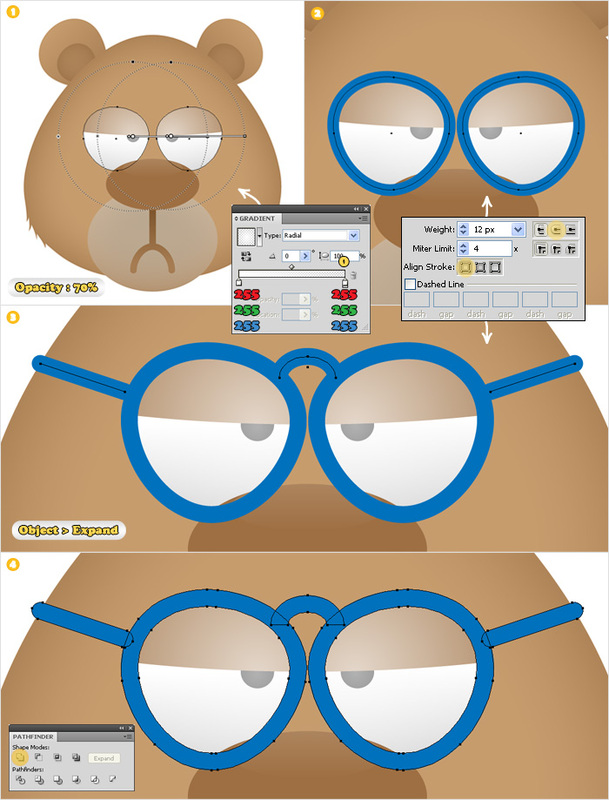 Create a 700by700px document and start with the head shape. Select the Ellipse Tool(L), create a shape like the one shown in image #1 and fill it with R=198 G=156 B=109. Select this shape, add the Bulge effects (Effect > Warp > Bulge) and the Shell Lower effect (Effect > Warp > Shell Lower) then go to Object > Expand Appearance. 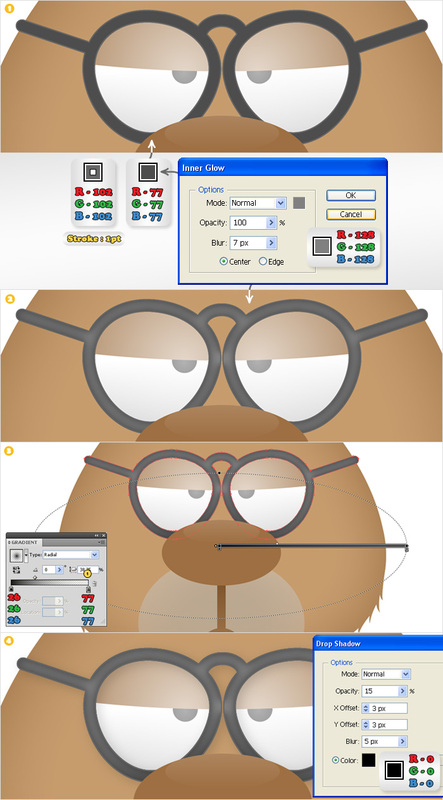 Select the Pen Tool(P) and create a shape like the one shown in the left side of the head. Duplicate this shape, flip it horizontally (with the Reflect Tool) and move it in the right side of the head. 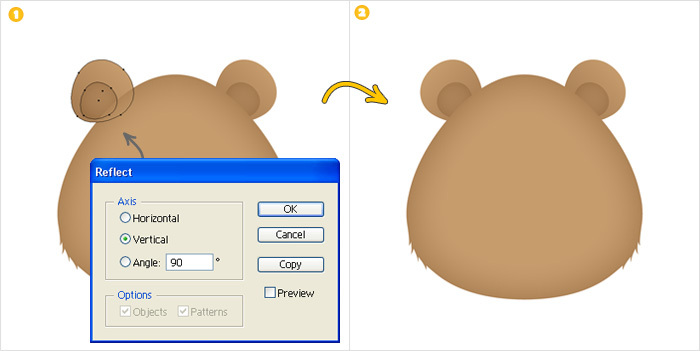 Select these two shapes along with the head shape and click on the Unite button from the Pathfinder panel. Make sure that the resulting shape is filled with R=198 G=156 B=109 then add the Inner Glow effect shown below image #2. Let’s continue with the ears. 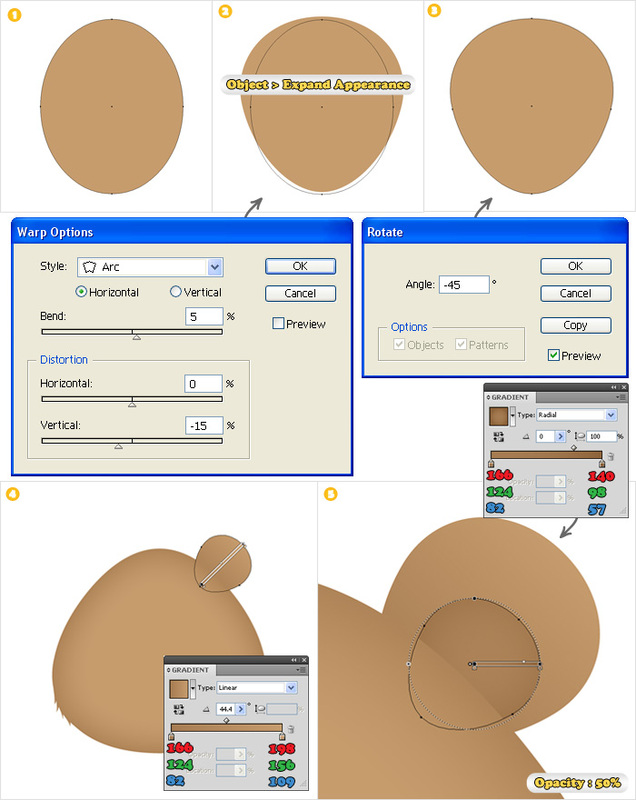 Select the Ellipse Tool(L) and create a shape like the one shown in image #1. Fill it with any color you want (for the moment), add the Arc effect (Effect > Warp > Arc) then go to Object > Expand Appearance. 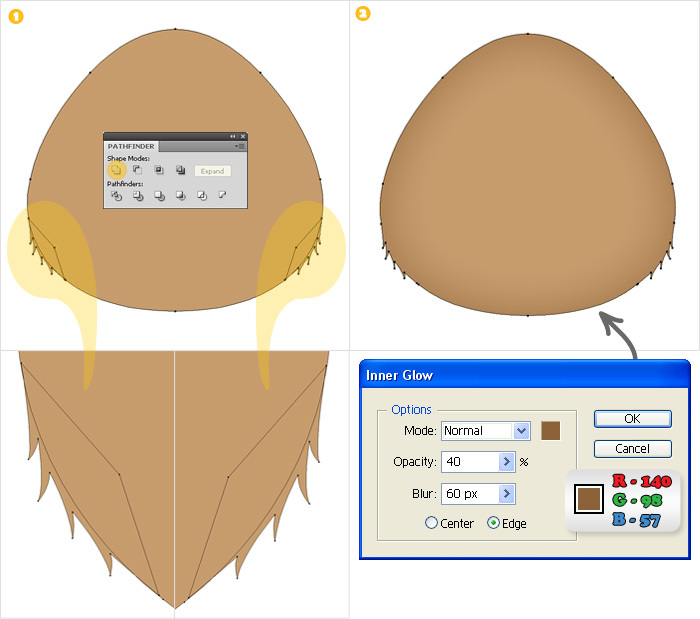 Rotate the resulting shape -45° (Object > Trasnform > Rotate) and send it in the back of the head shape. Place this shape as shown in image #4 then fill it with the linear gradient. Duplicate this shape (Ctrl+C > Ctrl+F). Resize this copy and place it as shown in image #5. Finally fill this shape with the radial gradient and lower its opacity to 50%. Duplicate the shapes made in the previous step. Move these two copies to the left (image #1) the go to Object > Transform > Reflect. Check the Vertical button then hit Ok. Select the Ellipse Tool(L), create a shape like the on eshown in image #1 and fill it with R=199 G=178 B=153. Select this fill (from the Appearance panel) and add the Inner Glow effect shown below. Next, add a new fill for this shape (from the flyout menu of the Appearance panel). Use the radial gradient for this new fill and lower its opacity to 60%. Let’s continue with the nose. Reselect the Ellipse Tool(L), create a squeezed shape (image #3) and fill it with R=158 G=111 B=66. Create another shape above the nose, fill it with the gradient shown in image #4 then lower its opacity to 60%. Pick the Pen Tool(P) and create a simple vertical path (image #1). Fill it with none and add a 12pt stroke (any color). 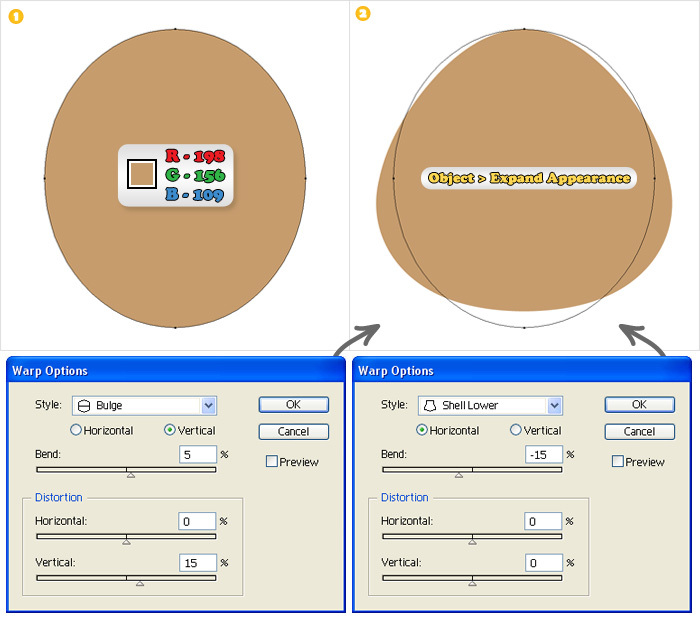 Next, select the Ellipse Tool(L) and create an oval like the one shown in image #2. Fill it with none and add a 12pt aligned to center stroke. 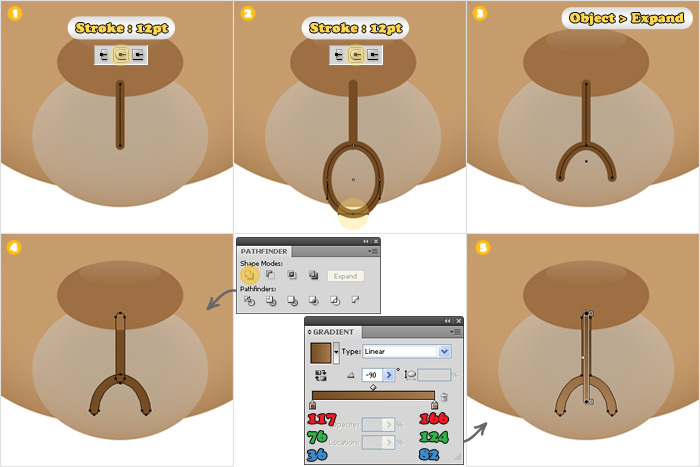 Select both shape, click on Stroke (the text) from the Appearance panel and click on the Round Cap button. Select the bottom anchor points of the oval (with the Direct Selection Tool) and hit the delete key. Select these two paths and go to Object > Expand. Now, send the resulting shapes in the back of the nose then click on the Unite button from the Pathfinder panel. Fill this final shape with the linear gradient shown in image #5. Let’s continue with the eyes. 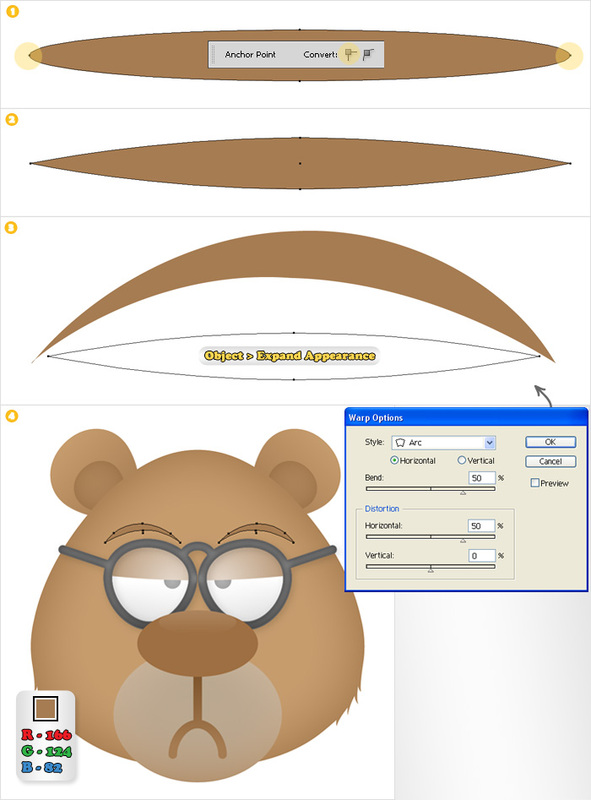 Select the Ellipse Tool(L) and create a shape like the one shown in image #1. Add the Arc effect then go to Object > Expand Appearance. Fill the resulting shape with the linear gradient shown in image #3. Create a copy of this shape, move it to the left and flip it horizontally. Move both shapes behind the nose. Duplicate the shapes made in the previous step. Select the Ellipse Tool(L) and create a shape like the red one shown in image #1. Select it along with the copies and click on the Divide button from the Pathfinder panel. Keep only the shapes shown in image #3 (delete the rest) and fill them with R=166 G=124 B=82. Reselect the Ellipse Tool, create to small and black shapes and move them behind the eyelids. Next are the glasses. Let’s start with the lenses. Duplicate the eyeball shapes. Move these copies in front of the eyelids and fill them with the radial gradient shown in image #1. Decrease their opacity to 70%. Once again, duplicate the eyeball shapes. Move these copies in front of the lenses. Fill them with none and add a 12px aligned to center stroke (for the moment use any color you want). Next, select the Pen Tool(P) and create three new paths (image #3). Use the same properties and check the Round Cap button. Expand all these strokes then select the resulting shapes and click on the Unite button from the Pathfinder panel. Move the shape resulted from the previous step behind the nose. Fill it with R=77 G=77 B=77 and add a 1pt aligned to inside stroke (R=102 G=102 B=102). 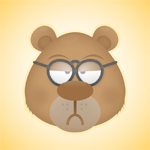 Select the fill (from the Appearance panel) and add the Inner Glow (Effect > Stylize > Inner Glow) shown below image #1. Add a new fill for this shape and use the radial gradient shown in image #3. Reselect this path and add the Drop Shadow (Effect > Stylize > Drop Shadow) effect shown in the final image. Now the eyebrows. Pick the Ellipse Tool, create a squeezed shape like the one shown in image #1 and fill it with R=166 G=124 B=82. Next, select the left and the right anchor points (with the Direct Selection Tool) and click on the “Convert selected anchor point to corner” button. Select the resulting shape, add the Arc effect then go to Object > Expand Appearance. Create a copy of this new shape and flip it horizontally. Resize and place these two shapes as shown in image #4. Finally, let’s add some some small details. 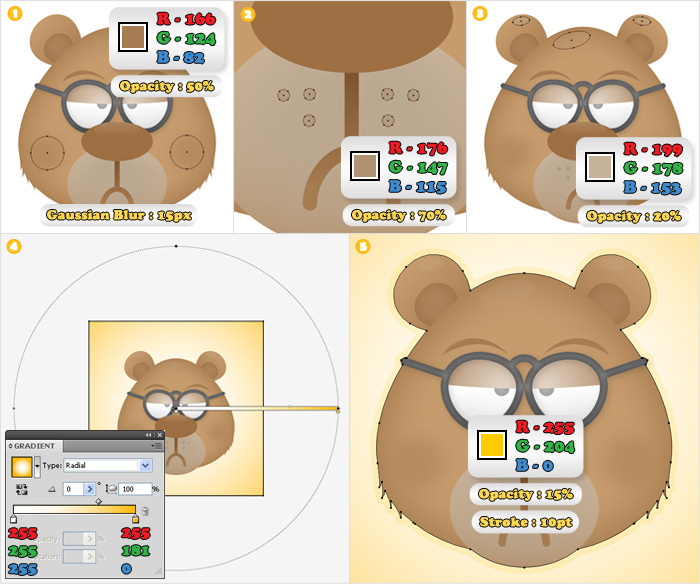 First, select the Ellipse Tool(L), hold Shift, create two perfect circles and place them as shown in image #1. Fill them with R=166 G=124 B=82, add a 15px Gaussian Blur effect (Effect > Blur > Gaussian Blur) then decrease the opacity for both shapes to 50%. 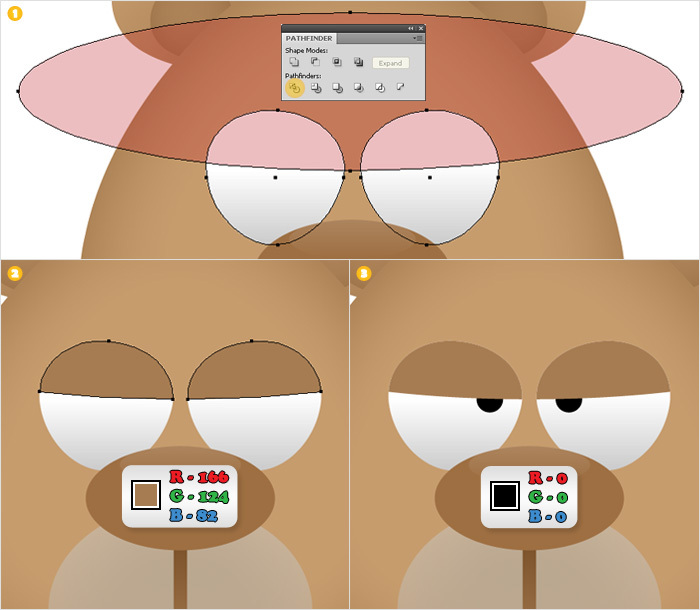 Next create six small circles just below the nose (image #2). Fill them with R=176 G=147 B=115 and lower their opacity to 70%. 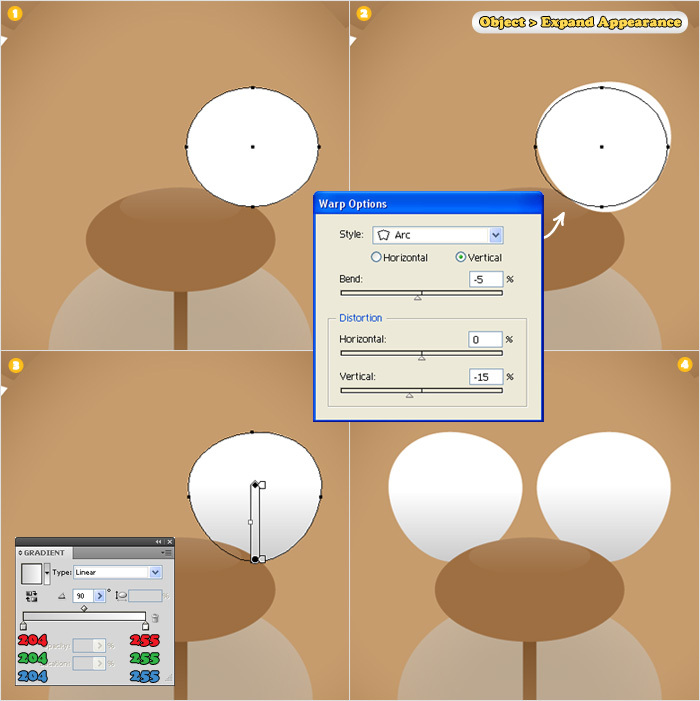 Once again with the Ellipse Tool(L) create three ovals and place them on the ears and in the top of the head (image #3). Fill them with R=199 G=178 B=153 and lower their opacity to 20%. For the background create a 700x700px square and fill it with the radial gradient shown in image #4. For one final detail duplicate all the shapes created so far (except the background). Unite these copies. Fill the resulting shape with none and add a 10px aligned to outside stroke (R=255 G=204 B=0). Lower the opacity of this stroke to 15% and you’re done. I loved creating this x-( …. thanks for the tutorial. Thanks! I’ve tried it a few times (to create vexel art), but I didn’t reach a satisfactory result. Maybe I’ll give it a another try now that you asked me to. Great tutorial and excellent result! Thanks so much! This tutorial is incredible. 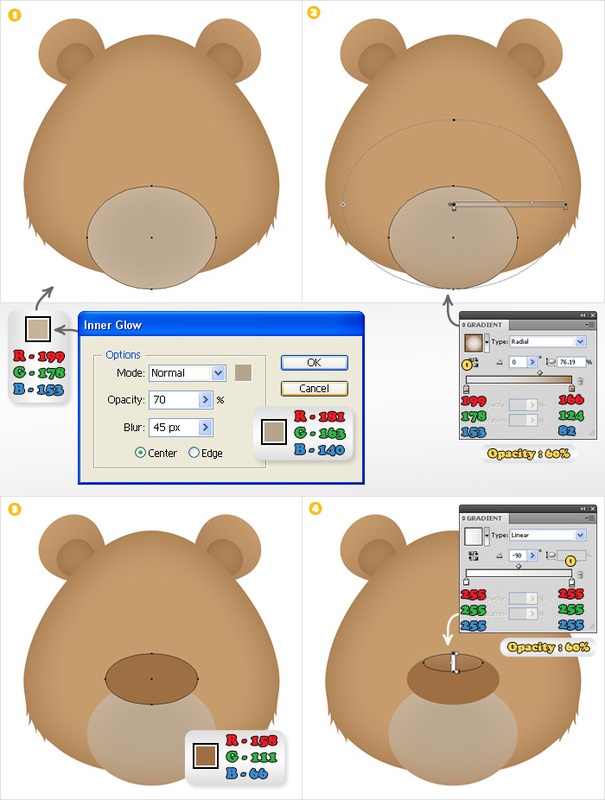 I love how you used Illustrator’s native tools to create this bear. I’m new to Illustrator so I’m looking for useful tutorials all the time and I’d say this one is very useful to me. thank you. I also have a request. Can you make a tutorial about a fictional logo. Something like what you’d find at Logopond.com. And can you do another tutorial on how to create swirls? if so, thanks. Thanks, I’m glad you like my tutorial and that you find it useful. I’ll think about your logo request. Regarding the swirls, you can easily make them with the Twirl Tool. Create a simple circle (with the Ellipse Tool) then select the Twirl Tool and click(&hold) on the circle. Double click on the Twirl Tool (in the Tools panel) if you want to change some of its options. Let me know if it helped you.